Examples of the fallout abound among recipients of Saudi largess. They include institutionalized discrimination In Pakistan against Ahmadis, a sect considered heretic by orthodox Muslims, as well as biased policies towards non-Muslims and Shiites in Pakistan, Malaysia and Indonesia. Like in Pakistan, of which Bangladesh was part until, 1971, the military as well as political parties maintained opportunistic ties to militants such as Jamaat-ul-Mujahideen and Harkat-ul-Jihad that were often as opposed to secularism as they were to Saudi-style monarchy. As a result, Bangladesh, the world’s fourth largest Muslim nation, is at the heart of a struggle between liberalism and ultra-conservatism that questions Saudi Arabia’s legacy and is about reforms that go beyond anything envisioned by Prince Mohammed. It is a battle in which free-thinking, journalists, writers and intellectuals have paid a heavy price. 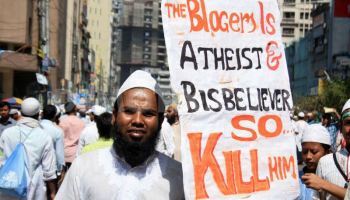 In the latest incident earlier this month, prominent scholar, award-winning science fiction author and outspoken critic of religious militants, Muhammed Zafar Iqbal was stabbed and seriously injured in a knife attack in the north-eastern town of Sylhet.